The firm was founded in 1925 by the trained woodwind maker Julius Keilwerth and has played a leading role in the world [instrument] market for [many] decades. The Julius Keilwerth firm has built its name on the manufacture of [high/top] quality instruments that have been exported to almost every country in the world, mainly the USA. In 1964 the two businesses in Nauheim and Gross-Gerau were brought together in a new works [, also] in Nauheim. Since then the clearly structured [well laid out] building has offered the best working facilities for the specialist tradesmen. At the time of moving into the new building, Keilwerth had already been producing and selling high quality trumpets, trombones, clarinets and flutes for a long time. This new building brought not only optical advantages to the world’s largest saxophone factory – what was more important was that it resulted in a rational manufacturing process being achieved and [production] capacity being increased. Don Menza and Jack Kripl – to name only two of the world’s best saxophonists – play on a Julius Keilwerth instrument [as do] well known and leading musicians like Joki Freund, Ambros Seelos and many others. These superb musicians often visit the Nauheim works, to swap experiences and make suggestions for the future [improvements]. The many players of Julius Keilwerth instruments treasure the knowledge that the purchase of this proprietary brand includes outstanding customer service, which is indispensible for all musicians. 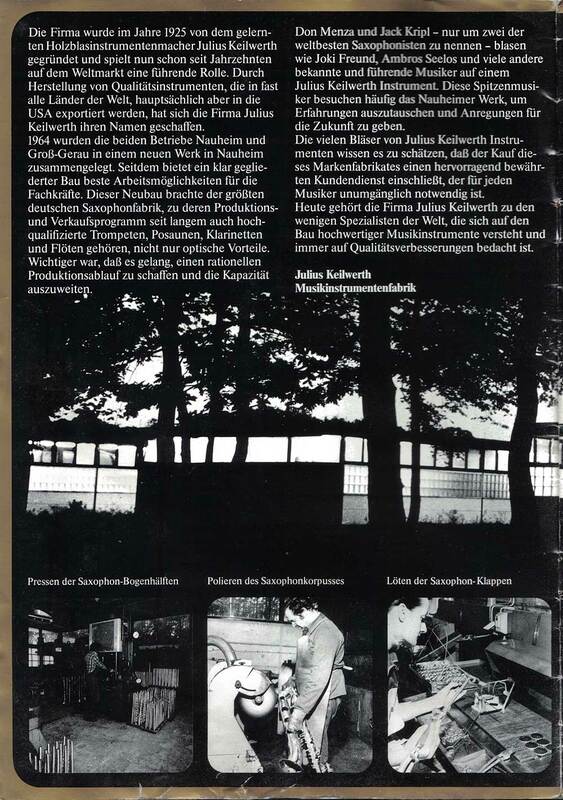 Today the Julius Keilwerth company is one of the few specialists in the world that insists on high quality in the construction of its musical instruments and is always intent on improving them.